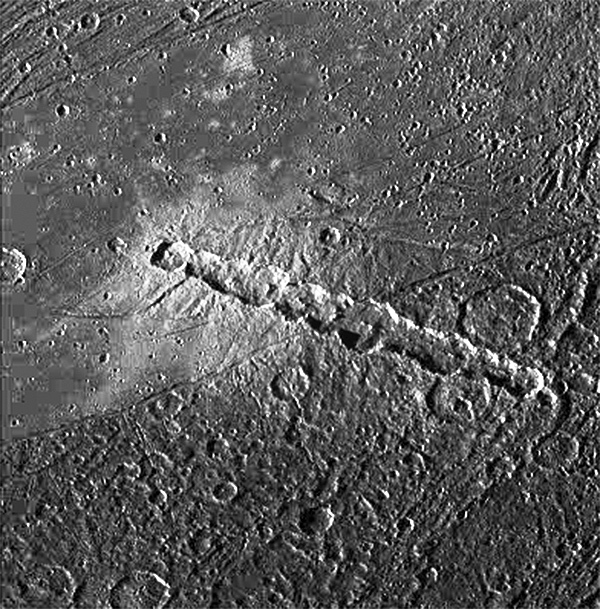 Captured by NASA’s Galileo spacecraft on April 5, 1997, this image shows Enki Catena, a 161.3-km (100-mile) long crater chain on the surface of Jupiter’s moon Ganymede. Named after the Sumerian god of fresh water, Enki Catena is thought to have been formed when a comet approached too close to Jupiter and was torn into 13 pieces, each impacting Ganymede in rapid succession… sort of a miniature version of what occurred in 1994 with comet Shoemaker-Levy 9. Ganymede is not only Jupiter’s largest moon but also the largest moon in the Solar System. At 5,268 km (3,273 miles) across it is larger than Pluto and Mercury, and is the only moon that generates its own magnetosphere. Launched in October 1989, Galileo arrived at Jupiter in December 1995 and orbited the giant planet 34 times before ending its mission with a dive into Jupiter’s atmosphere on September 21, 2003. Learn more about Galileo mission highlights here. Previous Post Could Humans Set Up Camp in Martian Lava Tubes? Next Post What is a Neutron Star, Anyway? This image is amazing. When we looked at Jupiter this summer with out telescope we wondered which moos was which but it was still wonderful to be able to see a planet with the three moons we were able to see.